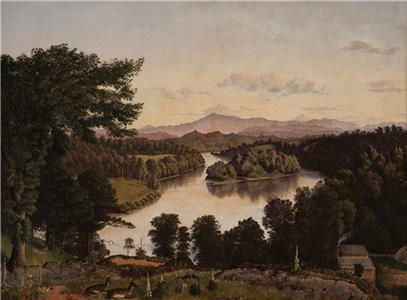 Belle Isle from Lyon's View, a view along the Tennessee River at Knoxville, by James Cameron, 1861. Oil on Canvas. In October, a bold new vision for the Tennessee State Museum will be realized when it opens at the northwest corner of Rosa L. Parks Boulevard and Jefferson Street at Bicentennial Capitol Mall State Park. It’s the first and only building in the museum’s 81-year history dedicated exclusively for its use. Housed in a 137,000-square-foot facility, the new location is built with the visitor in mind, with ample room to engage with history and the museum’s vast collection of art and artifacts. The permanent and temporary exhibitions on view when the Museum opens to the public on Oct.
4, at 1:30 p.m. tell a variety of stories ranging from the First Tennesseans up to the present day. There will be no admission charge for any of the Museum's new exhibitions. In the permanent galleries, Natural History introduces visitors to the origins of Tennessee’s amazing landscapes as well as its diverse animal and plant life, while also using fossils to show examples of life from long ago. First Peoples (13,000 BCE to 1760 CE) tells the story of how the First Peoples of Tennessee lived, about their culture, and how they defended their homelands against the European encroachment. Forging a Nation (1760-1860) delves into the stories of Southeastern Indians and Overmountain People, enslaved and free African Americans, the Creek War and War of 1812, Andrew Jackson, the Trail of Tears, President Polk, westward expansion, and more. In The Civil War and Reconstruction (1860-1870), visitors will learn how Tennesseans determined to secede from the Union and how the state remained divided on the issue throughout the war. Major battles and personalities are featured, including the experiences of common soldiers. African Americans are highlighted as they seek their own freedom, and some eventually fight for the Union. Also examined is how Tennesseans struggled to find a place in a world without slavery during the era of Reconstruction. Following Reconstruction, Change and Challenge (1870 to 1945) explores how Tennesseans found ways forward through economic upheavals, social changes, and international conflicts. Visitors will learn how Tennessee women fought for the right to vote. Visitors will also examine how Tennesseans shared the nation’s challenges in World War I, the Great Depression, and World War II, and see artifacts such as World War I hero Alvin C. York’s Medal of Honor. Exhibits in the most contemporary permanent gallery, Tennessee Transforms (1945 to Present), highlight the impacts of post-war innovations on Tennesseans, the struggle of African-Americans to share in the new prosperity, the development of Tennessee’s music industries and their importance in shaping how outsiders view Tennessee, and how today’s Tennessee has emerged as a reflection of these dynamics. The Tennessee Time Tunnel serves as the backbone for the entire permanent gallery experience, combining content-rich artifacts, exhibits and stories from our permanent collection with engaging media and thought-provoking interactives for a multi-layered experience. Five additional galleries provide an opportunity for the Museum to tell even more stories. The State of Sound: Tennessee’s Musical Heritage uses artifacts, images, performance costumes and audio-visual media to introduce you to the stories of the people, places and events that transformed Tennessee into an internationally celebrated music center. Tennessee and the Great War: A Centennial Exhibition explores the state’s role in the Great War. Also opening are Early Expressions: Art in Tennessee Before 1900, In Search of the New: Art in Tennessee Since 1900, and Red Grooms: A Retrospective (through January 13, 2019). “Tennessee has stories to tell,” said Ashley Howell, executive director of the Tennessee State Museum. “Our permanent exhibitions highlight our collection to tell those stories; to introduce our visitors to the people and places and events that have made the state’s history so dynamic. Our opening temporary exhibitions highlight eras, individuals and artists that have further contributed to the development of Tennessee’s identity within the state, and role on the national and international stage. Thursday, Oct. 4: 1:30 p.m. - 8:00 p.m.
Friday, Oct. 5: 10:00 a.m. - 5:00 p.m.
Saturday, Oct. 6: 10:00 a.m. - 5:00 p.m.
Sunday, Oct. 7: 1:00 p.m. - 5:00 p.m.
Monday, Oct. 8: 10:00 a.m. - 5:00 p.m.
More extensive information about each gallery, along with information about directions, parking and extended hours, will be available when the Museum’s new web site at tnmuseum.org launches in late September.